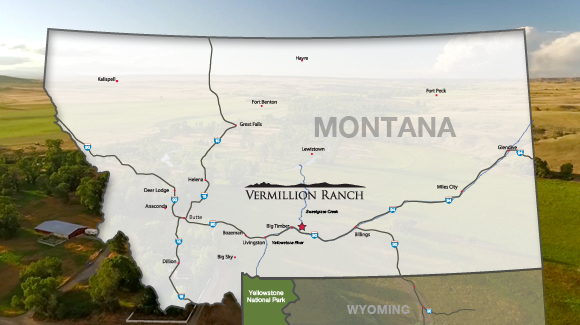 The Vermillion Ranch is located in the heart of Montana’s finest trout country. With its frontage on the Yellowstone River, numerous riffles, eddies and pools provide a myriad of fly-fishing opportunities. Along the property, trout average 16 inches with 20+ inch fish caught on a regular basis. The Yellowstone River is a wonderful dry fly river with great mayfly and caddis hatches in April and July, and exceptional terrestrial fishing with hoppers in August and September. In addition to the Yellowstone, guests at the Ranch are a short drive from the Boulder River, the Stillwater River, and the Spring Creeks of Paradise Valley, as well as an endless collection of mountain streams and lakes that all can be waded or drifted. The Vermillion Ranch also has two ponds on the property stocked with trout, bass, and sunfish. The trout run as large as eight pounds; most of them average around 18 inches. This is an excellent spot for kids learning to fish. These ponds also make for great summertime swimming, floating, and zip-lining. For more information, contact Sweetwater Travel at 406.222.0624. The Ranch also hosts a significant variety of wildlife. Grouse, pheasant, painted turtles, and antelope all live on the ranch and visitors can spend evenings sitting in our wildlife blinds and watch the animals as they feed on grass and alfalfa. For the bird-watchers in the family, the area is home to ducks, geese, eagles, owls, herons, various songbirds and a resident population of Sandhill Cranes during the summer. Get a private tour of wildlife viewing in Yellowstone National Park with Yellowstone Guidelines. The Vermillion Ranch does not have horseback riding available on the ranch. We do, however, partner with a local horseback outfit named Paintbrush Adventures. They are a short drive from the ranch (40 minutes) and offer a variety of riding opportunities. They can be reached at (406)328-4158. The Rocky Mountain terrain surrounding the Vermillion Ranch is a mountain biker’s dream, with its varying levels of difficulty and abundant scenery. Bikes can be rented in Billings, Bozeman, or Livingston. Many of the hiking trails are also great for mountain biking, but not all – be sure to inquire with the rental shops. Cool off in the river or the Ranch’s ponds, stocked with inner tubes, various watercraft and a Zip Line for summertime fun. Or toss a tube in the Yellowstone River and float down the lazy current while taking in spectacular views. For those who are truly sweating in the late July sun, a dunk in Sweetgrass Creek which drains out of Crazy Mountains should do the trick. On the other end of the spectrum, the Boiling River just inside the north boundary of Yellowstone Park is an incredible natural hot springs and the perfect destination on the off chance of a rainy day. Looking for a river adventure? Checkout whitewater rafting and scenic river tours on the Yellowstone River near Gardiner, MT. America’s first National Park is a scenic and relaxing drive from the Vermillion Ranch (plan for about 2 hours, one way). The Park is filled with North America’s last great populations of elk, buffalo and grizzly bears. A popular Yellowstone excursion from the Ranch is the drive down Paradise Valley, through Yellowstone Park, over the Beartooth Highway, and through the quaint mountain town of Red Lodge, before meandering back up the Yellowstone Valley to the Ranch for dinner. For those who prefer to explore civilization over or in addition to the great outdoors, the Vermillion Ranch is an ideal location from which to experience some of Montana’s most charming communities. The cow town of Big Timber is home to some of Montana’s oldest cattle families and offers a unique combination of restaurants and western stores. Livingston is one of Montana’s most prolific art communities and is home to a number of art galleries, clothing stores, a theater, restaurants, and local breweries. And the larger cities of Bozeman and Billings offer fantastic live arts, museums, shopping, and dining. Summertime brings a variety of activities throughout the region, including rodeos, festivals, and county fairs.